Wheel brakes and shock absorbers. Internal pad with waterproof tray. This has to be a joke? If I saw someone pushing one of these I would have thought that they were mad. Cold as there is no adapter to attach it to a mobility scooter! When you start treating your dog like its your own offspring you really need to take a long hard look at your life. Heat from me, pure genius. Whooosh! 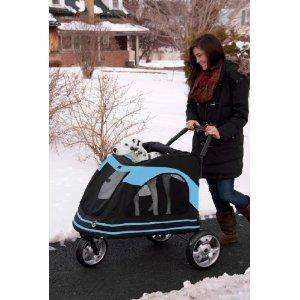 Somebody in their marketing department doesnt get the concept and benefits of taking your dog for a walk. One for the people who drive to the gym instead of walking, then go for pizza afterwards as a treat. You know who you are! One for the people who drive to the gym instead of walking, then go for … One for the people who drive to the gym instead of walking, then go for pizza afterwards as a treat. You know who you are! It's me! I drive to the pizza place driving past the gym if I want exercise, or if I am tired I just get it delivered. The money I save by not having gym membership goes on Pizza. It's me! I drive to the pizza place driving past the gym if I want … It's me! I drive to the pizza place driving past the gym if I want exercise, or if I am tired I just get it delivered. The money I save by not having gym membership goes on Pizza.